Ultra premium grain-free senior dog food from Big Dog World. 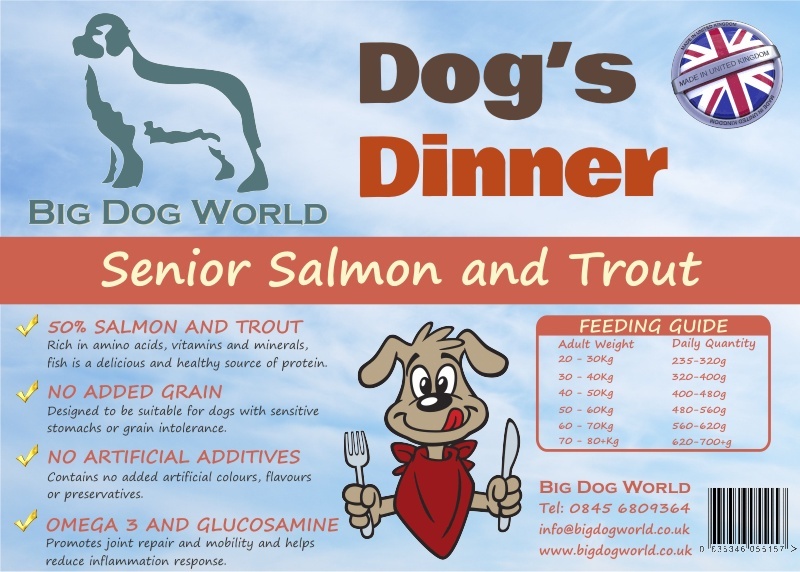 Dog's Dinner Senior with Salmon; Trout; Sweet Potato and Asparagus is a delicious recipe that your dog is sure to love. With 50% fish content and added Omega-3 for healthy coat and joints. We believe our foods offer the best combination of quality and value of any dog food on sale today. Trout & Salmon 50% (including freshly prepared Trout 30%; Dried Salmon 11%; freshly prepared Salmon 4%. Salmon Oil 3%; Salmon Stock 2%). Sweet Potato 24%; Potato; Peas; Beet Pulp; Pea Protein; Linseed; Potato Protein; Minerals; Vitamins; Vegetable Stock; Asparagus (equivalent to 7.5g per Kg of product); Glucosamine (170 mg/kg); Methylsulfonylmethane (170mg/kg); Chrondroitin Sulphate (125 mg/kg); Prebiotics - FOS (92 mg/kg); MOS (23 mg/kg).